Earnings season kicks off in the week ahead. 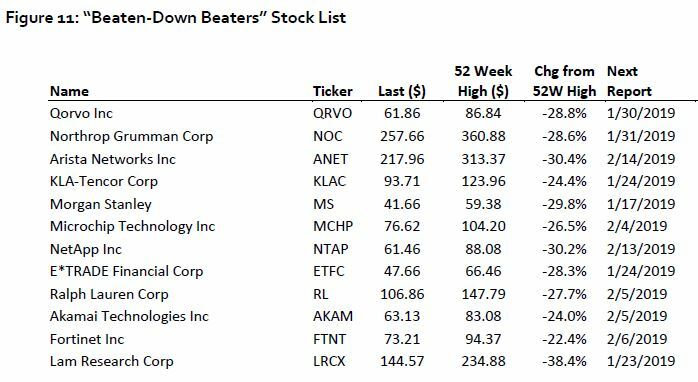 Analysts say it could generate some relief rallies, and investors may find some winners among individual stocks that have been beaten down. Profit growth is expected to average a strong 14.7 percent, but the test for the market will be what type of news companies have on the current quarter and the rest of 2019. After a swift move higher, the market could consolidate or even back down as the S&P 500 reaches a major resistance level at 2,600, analysts say. Earnings will be the big focus but there are a few economic reports, like PPI and industrial production in the coming week. After the market's December meltdown, earnings season could turn up some winners among the rubble, analysts said. What fourth-quarter results will do for the market's rebound from December's trough is tough to say, given other factors, like trade talks, Washington dysfunction and the U.K.'s upcoming Brexit vote. But analysts do see some potential for positive reactions in individual stocks, even with the diminished expectations for 2019 earnings. Fourth-quarter reporting season kicks off this week with major banks Citigroup on Monday, J. P. Morgan on Tuesday and Bank of America and Goldman Sachs on Wednesday. There are a few important data releases, like PPI on Tuesday and industrial production on Friday, but reports on retail sales and housing starts have been delayed because of the 3-week-old partial government shutdown. Analysts expect earnings to be fairly strong, but are watching to see what companies say about the current quarter and the rest of the year, given expectations for a slower-growing economy and lower profit growth. "In our view the bulk of the decline is clearly behind us," said Julian Emanuel, chief equity and derivatives strategist at BTIG. Earnings could boost the overall market, but there are also geopolitical and other factors that could affect stocks. "It wouldn't be a shock given the stiff resistance around 2,600 that it could pull back a ways." Emanuel said he switched last week from a posture of buying on the dips to buying the market. "We are not in a bull market fully yet. We are in a transition stage. You switched from both bad news and good news being sold in the last quarter to good news being bought, but if you're really in a bull market, both good news and bad news is going to be bought." "We thought earnings season would still be a net beat but with more mixed results," said Keith Parker, chief equity strategist at UBS. "The key will be about 2019 guidance and what we've seen thus far is revisions to 2019 a bit more than the post-crisis average. ... The big bar reset typically happens during the first quarter, during fourth quarter reporting. We already saw expectations drop down a lot." "Our view is we'll probably have more mixed results and guidance going into the quarter, but it does raise the likelihood of relief rallies, given where positions and expectations are," Parker said. He said health care could be a positive. "Health care has positive revision trends. We think they have a better earnings, sales backdrop," he said, noting that in consumer discretionary, lodging and restaurants stand out. Earnings are expected to be strong, up 14.7 percent in the fourth quarter, but the fourth quarter is a transition period. Corporate executives could find themselves showing off double-digit profit growth, while discussing the activity in the current quarter, which is expected to see much slower profit growth. First-quarter earnings are expected to be up around 3.9 percent, according to Refinitiv. Earnings in 2018 were up about 23.5 percent, but 2019 gains are expected to average just under 7 percent for the year. BTIG's Emanuel said the market may be ready to reward positive news, and the biggest winners could be those that beat expectations for revenue and profit. Emanuel said in the last two earnings seasons, many companies that beat were hardly rewarded while those that missed on both profit and revenue fell an average 3.2 percent in the July period and 5 percent in October's reporting season. "Estimates have come down quite sharply for the quarter and the year. It's a mixed bag in that you've seen a raft of pre-announcements. You've seen positive reactions, negative reactions. The positive reactions have been skewed toward more cyclical companies. You've seen the worst reactions for some of the most defensive names," he said. BTIG said vulnerable names could be those that haven't declined that much but that have missed on earnings in the past. The firm's analysts screened for stocks which have disappointed on both earnings and revenue during two or more quarters since the first quarter of 2017 and have declined less than 10 percent from their year highs.